I don't do a lot to my skin each day, I (badly) don't wash it every day. But one thing I always do each day and have noticed a massive difference in my skin is use these products. All three products are really affordable and make such a difference. For reference my skin type is oily and I get most of my breakouts/millions of small pimples on my forehead and in between my eyebrows. This brand has recently grown hugely in popularity with all The Ordinary skincare products sold out on Asos, I had to buy mine from their official website. I have tried 5 of their serums and this one for me works wonders. The Niacinamide 10% + Zinc 1% it is a high-strength vitamin and mineral blemish formula so it really is made specifically for blemishes. I put 4 drops of this all over my face and rub it in, I mainly only use this at night although you can use it in the mornings as well although I find as it has a bit of a sticky feeling to it I only use it at night as it does not completely sink in. 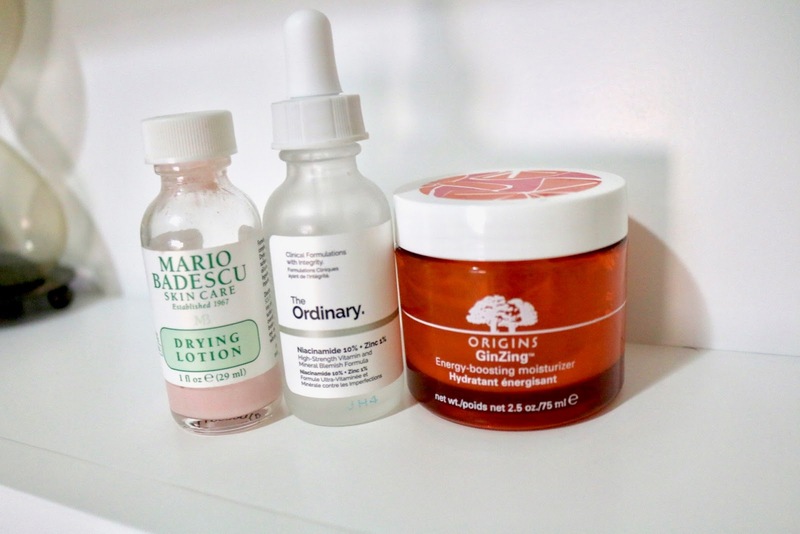 Although I use The Ordinary blemish serum most nights, the nights that I decide to not use it is when I am using the Mario Badescu drying lotion, I have written about this product before on this blog. I truly love this product any big pimple that I have anywhere on my face or even small pimple I use a que tip dunk it into the solution and dot it over my pimple. I have noticed that it does not work as well if you are using this over serums or moisturisers so for the full effect just use this on the pimple at night time before you go to bed. The drying lotion dries within 2 minutes and does not stain or imprint on your pillows although it does sometimes come off during the night depending on how you slept. This year one thing that I have been using daily is my origins moisturiser. Although it is only a moisturiser it has done wonders for my skin as even though the conception is that people who have oily skin shouldn't put too much moisturiser on, your skin needs hydration as much as dry or combination skin. So moisturise morning and night, it will give you a natural glow. I hope this gave you some more information on how good these products are and how they work. Let me know in the comments what your number 1 skincare product is, I'd love to know.